Happy 18th Anniversary, The Syndicate! 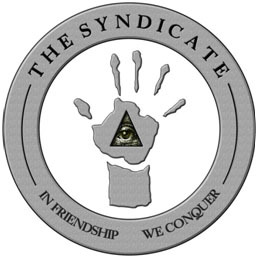 It’s hard to believe but eighteen years ago this month a small community was created, known as The Syndicate. Back in 1996 the world of gaming was very different than it is today. The Internet was connected by dial-up modems, monitors only had 256 colors at most, and high-end graphics cards only had a couple Megabytes on them. The Syndicate is different than a lot of other guilds. They have spanned numerous communities and games. They are not just a large guild; they hold the Guinness World Record for the longest, continuously operating, online gaming community. They even have their own annual convention called “SyndCon” which has been running for twelve years. They’re deeply passionate and experts about all things gaming. So why are we talking about The Syndicate on Planetside 2? They’ve helped to shape the Planetside 2 Wikia into what it is today. Some of the pages they’ve authored include Getting Started, Vehicles, Factions, Base Strategies, the fantastic maps pages, and more! They started doing content for the PS2 Wikia in November 2012 and they helped out again throughout early 2013. Earlier this year we then asked them to come back to help update some of the things that’ve changed. In a little over a year the Planetside 2 Wikia has grown from zero pages to a hefty 961. That has been thanks to our awesome Wikia contributors and to the amazing people at The Syndicate. On behalf of all of us at Sony Online Entertainment, THANK YOU! And of course, Happy 18th Anniversary! The Planetside 2 Wikia is really one of the best-in-class wikis out there. Keep going strong, soldiers!